ETI0001-1488A1 does not require a separate PDU since the PDUfunctions are already integrated into the UPS module. This saves rack space,cabling and expense while improving overall reliability. The heavy-duty chassis occupies only 6U (10.5”) ofrack space for the electronics module and 2U (3.5”) for the battery module. Therounded metal corners and rugged handles, both front and rear, aid in safehandling. Internally, all major components are well secured and electrically insulated to preventdamage due to shock and vibration in any axis. These units can be mountedhorizontally or vertically. Optional heavy-duty rack slides provideeasy installation and removal of the unit with full extension. The LED arrays keep the operator informed as to the unit's status including load and battery levels. The high intensity audible alarm can be heard in high noise environments and includes an audible disable switch. All controls and protective devices are brought to the front and rear panels with critical switches or circuit breakers having finger guards. Further, all front panel devices are recessed to prevent damage or accidental operation. The internal intelligent PDU allows control of the individual output circuits incorporating thermal and interlock interfaces for additional control and safety. The rear panel provides locking MS threaded metal shellconnectors for the input and output power with various optional configurationsavailable. The Status connector provides aninterface with optional computer software providing loss of AC and low battery status as well as remote shut down capability. Thisunit draws air through the front air filter and exhausts out the rear vent into the rack.This allows the unit to be used in negative or neutral pressure racks. Forpositive pressure racks, rear to front or rear to side versions are available. The removable and washable metal screen air filters and high capacitystainless steel ball bearing fans provideadded protection in both controlled and hostile environments. ETI0001-1488A1 has the added benefit of having afield replaceable battery via separate rackmount battery modules. The batteries are maintenance free with immobilized electrolyte and areconstructed of flame retardant materials. For more information, see the BatteryTechnology section. ETI0001-1488A1 includes the built-in eDocs Port™, a patented feature unique to Energy Technologies, Inc. This flash drive contains all the relevant documentation for the unit at hand. This includes Operation and Maintenance manuals as well as training and troubleshooting guides. Utilizing a standard USB interface, these standardized electronic documents are readily available to the user. 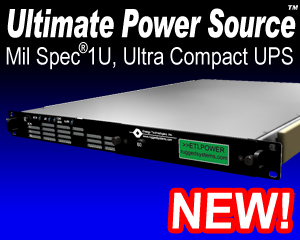 See the Power Distribution Units section for a listing ofstand alone PDUs. See the N3 Series UPS section for UPS withoutthe integrated PDU and remote control. Overall, the Rugged Power line is uniquely qualified for critical shipboard,vehicle, airborne or land based systems combining advanced modular designfeatures with highly reliable construction.